Scientists have recovered more than a billion fossils, but no discovery has been more breath-taking than the fossils recently found in northern China, findings which prove that several families of dinosaurs had feathers, or feathery hair-like coverings, adorning their bodies. 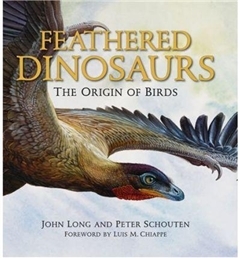 Now in the beautifully designed Feathered Dinosaurs, paleontologist John Long and illustrator Peter Schouten provide a stunning visual record of these extraordinary prehistoric creatures, illuminating the evolutionary march from primitive, feathered dinosaurs through to the first true flying birds. Schouten, an acclaimed natural history artist, has created 80 full-colour paintings that capture the striking physical traits of these feathered dinosaurs. Drawing on his extensive knowledge of the lifestyles of modern birds and mammals, plus the extant scientific data regarding how these dinosaurs might have looked and behaved, Schouten has produced not only the most beautiful but also the most accurate visual representations of these animals in print. Equally important, John Long, a noted paleontologist and widely published science author (with some 24 books to his credit), provides an engaging companion text that places these feathered dinosaurs within the larger family of dinosaurs--for instance, outlining their relationship to T. Rex and Velociraptor, species well known to Jurassic Park fans. He discusses the factual information that can be deduced from their fossil remains, in effect providing an insightful natural history of this remarkable group. A true marriage of art and science, Feathered Dinosaurs presents an unprecedented visual record of one of the most significant breakthroughs in the history of vertebrate paleontology--the discovery that many predatory dinosaurs were cloaked with feathers, perhaps just as colorful and fanciful as those of their living relatives.